What survives of dictatorships after revolutions? In what way is dictatorial violence residual, manifested in bodies, infrastructures, and landscapes long after the dictator is gone? And how do these violent depositories shape post-revolutionary realities? ‘Nheb Naish (We want to live): Stop Pollution’ graffiti in the city of Gabes, where Tunisia’s phosphate industry poison’s people, animals, land, and sea. The la'ana Grafitti, a public curse: "God Will not Have Mercy on the Parents of Those that Dump and Burn Rubbish Here." Weeks after the Tunisian revolution of 2011, piles of rotting garbage filled the streets, sewage was running in the rivers, and toxic waste was pumped into the Mediterranean in unprecedented amounts. The uprising unveiled, and in part created, what Tunisia’s former Prime Minister Habib Essid (2015-2016) called an “environmental catastrophe” that had been festering under the dictatorship for decades. During the reign of Zine Abedinne Ben Ali (1987-2011) the Bretton Woods Institutions (World Bank and International Monetary Fund) hailed Tunisia as North Africa’s poster child of economic development—and like elsewhere in the world, this growth was fueled by the creation of waste. In the heyday of structural adjustment, industrial parks burgeoned, plastic bags and packaging appeared, enveloping an ever-increasing amount of consumer products, but the nascent waste management system could not keep up. The situation was similar across the African continent, of course; however, in Tunisia this reality was hidden by a façade of democratization and environmentalism kept in place through censorship of the media, tight state control over research, and torture and imprisonment of activists. ....The revolution has radically transformed the political landscape in Tunisia. It has rewritten the very principles of government with an inspiring new constitution that guarantees all citizens a “healthy and balanced environment.” But what revolutionaries throughout the ages have learned is that governance exists beyond political systems and legal documents, it is engrained in an unequal international order and its local manifestations. The specters of authoritarianism in Tunisia still haunt people’s minds, but they also dwell in their bodies and landscapes in real, tangible ways through the scars of torture, hunger, poverty, illness and the impacts of waste and pollution. Primarily, my dissertation research explored the link between authoritarianism and environmental degradation. It is a material and environmental history of the Arab Uprisings in Tunisia and a sensory exploration of its aftermath. Based on 15 months of research amongst Tunisians affected by the crisis, environmental activists, development practitioners and government employees, I argue that Ben Ali’s authoritarian neoliberalism produced unequal socio-natural relations between waste and certain bodies and landscapes. The regime sustained and concealed these inequalities through the manipulation of data, corruption, infrastructure and a facade of state environmentalism. I chart the emergence of this socio-spatial inequality from the racist hygienic ideologies of French colonialism through to structural adjustment programs and thereby interpret them in the context of the uneven social, economic and environmental costs of industries and global markets. 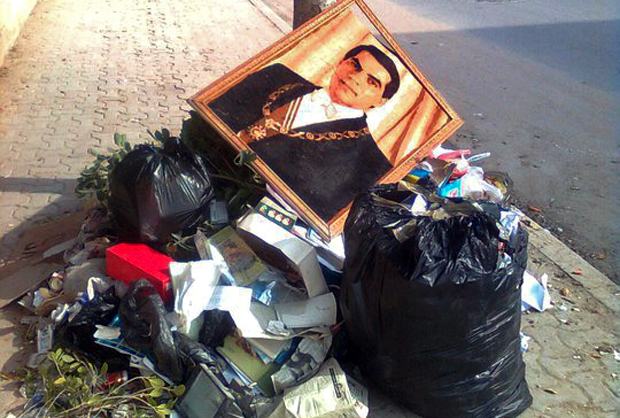 The study demonstrates that state environmentalism under Ben Ali was a particular governing fiction that rendered polluted communities invisible. Within this system corruption lead to environmental pollution by undermining the enforcement of environmental legislation, by producing decrepit waste management infrastructure, and by creating organizational cultures based on fear that further obscured environmental problems. I conclude that the waste crisis that followed the revolution was a rupture of political fictions that brought public secrets, formerly hidden communities and landscapes, viscerally to the fore. This revelation lead to struggles over truths and meanings of the dictatorial past. Due to the physical ubiquity of waste and the reemergence of marginalized communities associated with it, this conflict was expressed in the language of waste, thereby shaping the post-revolutionary experience of Tunisia and turning it into the balad el-zible (country of rubbish).